Gathering to deepen in connection with your own unique wisdom, to grow in conscious women’s community, to receive support on your path of remembering wholeness, and to amplify reverence for both our human-ness & the infinite divinity within and around us. Gather with us, sister... in the timelessness of sacred space as we commune with our own infinite wisdom in this circle of like-hearted women. While we receive insights and nudges from the lunar & seasonal cycles, archetypes, and the energies that arise to support our alchemical time together... we illuminate deeper layers of our being & our experiences. Together we dive in to our inner worlds, reflect on what is ready to be purified & fall away, allow our soul's truth to rise forth, and anchor into the vibration of our YES. This is a space for aligning with our own unique brilliance, cultivating easeful connections with the divine within, and remembering that we are infinitely supported both in the seen and the unseen. We create a sacred container for seeding transformation, attuning to the frequency of our desires, nourishing our hearts with the heart of circle, and receiving energy medicine to support the ever-unfoldment of our journeys. Sometimes we are cosmically called in to radical transformation, and sometimes we need to soften in to a space where we are held in the loving power of sisterhood… any expression of your divine self is honored here. The Breathwork system we use takes us on journey through the consciousness accessed by the breath. This Breathwork supports a deep REmembering of who we really are. Through this shifted state and increased awareness, we can experience wholeness, crystal clarity, deeply therapeutic transformation, rapid healing, personal empowerment, and boundless self-exploration. This is not similar to breathing techniques used in yoga or meditation that bring upon calm and relax the mind. This is an activated state that shifts the brain chemistry to "get the mind out of the way" and truly experience your infinite self. Connect with guides, ancestors, your inner medicine keeper, and clear insights that are soul-inspired, tangibly accessed, and deeply felt. The Full Moon offers us the ability & invitation to see with the fullest light of truth. We feel a readiness, a completion, a fullness, a release (real-ease). This time of ‘fullest illumination’ supports the deepened inner work because we have the most energy and possibility to serve an amplified and lasting transformation. We gather in this space to let. it. all. go. and create space for what we deeply desire. This smaller group allows for the big inner alchemy... similar to a one-on-one deep healing session while being held in an intimate ceremonial container and circle of sisters. This is the space to dive in to what is needing attention, healing, fortifying, purifying, clearing, activating, alchemizing, actualizing. We will work with all that needs to be seen, felt, held, and honored to support your forward movement. These circles fill quickly. Pre-Registration required to reserve a space. April’s Blossoming Circle is the only Full Moon Circle through the summer. This monthly circle will be on pause for special events until August 15th. Be sure to sign up for emails below for updates! 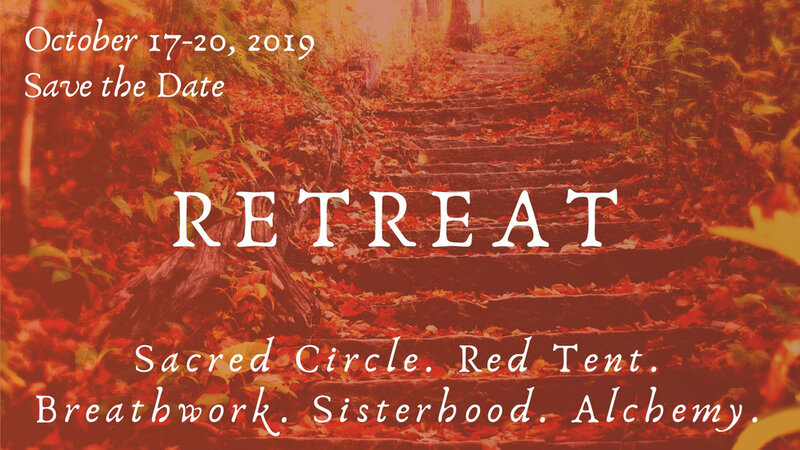 Retreat into four days of sacred ceremony, inner alchemy, breath-work, energy medicine, red tent, women's circle, and the magic of sisterhood. Add jessica@jessicaricchetti.com to your address book or primary tab in order to receive location information & other details the week of our gathering! * Your email address will remain secure, and you will not be spammed. Walking in Wholeness and Full Moon Breathwork circles are held in sacred space at a private residence in South Asheville. Address and other information sent via email the week of circle to all registered sisters. Space is limited to ensure close-knit community and a potent ceremonial container. All circles in this space are non-denominational and inclusive. No previous “experience” or “work” necessary. Join us as you are! Women’s circles can be perceived as inherently exclusive. These particular circles are not about ‘excluding men’ or rising in the feminine and leaving our brothers behind. We simply know the power of women coming together in support of our own unique balance, to bring that balance back in to our world, communities, relationships, and to all beings on our planet. Events are open to all who identify… we are all sisters, not just cis-ters. This is a space of inclusivity and loving kindness, not loving blindness. Welcome are all of our LGBTQ/GSM/DSG/GNC + sisters. If this is the place you are called to be, come be! You will be welcomed with an open heart. Email sisters receive first invitation for all sacred gatherings before events are announced on facebook and meetup. Join our email circle here! Just a reminder… this is not circle registration, this is email list subscription. To register for an event on this page, see instructions above. Private Ceremonies for RE-birthing days, Sacred Union, Dissolution of Union, Special Sister groups, Home & Land Clearings, and Life Changes. Programs & Trainings ~ Soon to come!